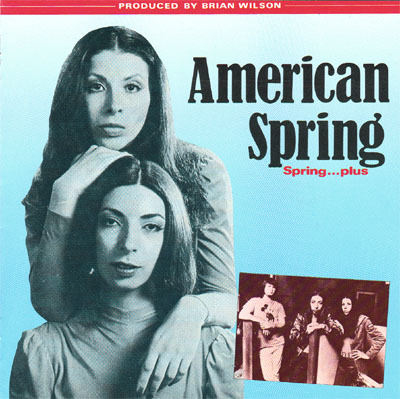 Spring (who were known as American Spring outside of the U.S. to avoid confusion with British and Canadian bands of the same name) recorded only one full-length album in 1972. Brian Wilson was the album’s executive producer, and was assisted in production by David Sandler and Stephen Desper. Brian also provided harmony and backing vocals (as did Mike Love and Carl Wilson), and he played piano, organ and synthesizer. Carl Wilson was one of three credited guitarists, the other two being jazz veteran Larry Carlton, and David Cohen from Country Joe and the Fish. Al Jardine was one of three bass players who played on the album. The Rovell sisters apparently did not aim to come across as impressive vocalists on this album; rather, they simply seemed to be playing the parts of grown-up California girls. (The liner notes by Ben Edmonds describe the album as "music without pretension"). In hindsight, Marilyn’s voice bears some resemblance to that of her daughter Carnie Wilson, who found success as part of Wilson Phillips a generation later. The actual extent of Brian’s participation in the recording of the Spring album has been disputed, but it has been said that Brian’s work on this album distracted him from the 1972 Beach Boys album Carl And The Passions – “So Tough” -- an album that certainly could have used more of his input. Whatever the case may have been, Brian’s influence is very noticeable on much of the album, as it has a recognizably Beach Boys-like California ambience. The duo’s cover of Patti Page’s 1950 country tune “Tennessee Waltz” has a definite Smile-era vibe, thanks to Brian’s quirky synthesizer contribution. The Brian Wilson/Mike Love composition “Thinkin’ Bout You Baby”, originally recorded by Sharon Marie in 1964, sounds almost exactly like the Beach Boys’ “Darlin’” with different lyrics. The duo’s rendition of Tommy Roe’s 1963 pop-rock song “Everybody” finds the middle ground between the Beach Boys and the Phil Spector girl groups. Despite these reminders of the Beach Boys’ and the Honeys’ ‘60’s backgrounds, Spring is very much an album of the early ‘70’s. It’s clear that this album was recorded when Carole King’s Tapestry album was all the rage; the duo’s cover of the Shirelles’ “Mama Said” has a strong King-like vibe, as do the two King co-compositions that close the album: the City’s “Now That Everything’s Been Said” and Little Eva’s “Down Home”. (Of course, it made perfect sense for girl-group singers to emulate the co-author of many girl-group songs). Another reminder of the album’s time period is a rendition of “Superstar” that musically resembles the Carpenters’ hit version more than the Delaney and Bonnie original. Although that song was originally written from the point of view of a groupie pining for a rock star, Spring’s version could be interpreted as a song about a musician’s wife waiting for her husband to return home from the road. Unfortunately, it’s not a particularly good rendition; the awkward innocence of the girl-group-like lead vocal does not suit the song well, and it suffers in comparison to the soulfulness of Bonnie Bramlett or the melancholia of Karen Carpenter. The Spring album is a good companion piece to the Beach Boys’ first two ‘70’s albums, which immediately preceded this album’s recording. Two songs from the Beach Boys’ 1970 Sunflower album were remade here: Brian’s “This Whole World” and Dennis Wilson’s touching ballad “Forever”. The transcendent ballad “Sweet Mountain” (written by Brian Wilson and David Sandler) would have fit in well on Surf’s Up, and “Awake” is also easy to imagine as a Beach Boys song from that time period. Spring also recorded a Sunflower outtake: the likably silly “Good Time”, which turned up five years later on the Beach Boys Love You album from 1977. The instrumental backing tracks sound identical to the Beach Boys recording, giving the song a slightly carnival-like atmosphere – and it’s amusing to compare the gender-reversed lyrical differences. 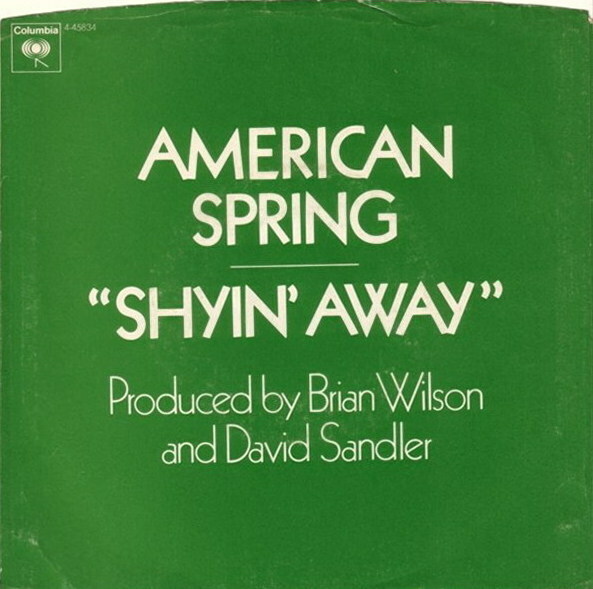 Spring did not record any more full-length albums as a duo, but they did release one more single on Columbia in 1973, billed as American Spring, and produced by Brian Wilson and David Sandler. The A-side “Shyin’ Away” should have been a hit. It’s a sunny pop song with a Carole King-on-the-beach feeling, sweetened with a California vibe reminiscent of the Beach Boys. The B-side “Fallin’ In Love” is a remake of the B-side (originally titled “Lady”) of an obscure solo single that Dennis Wilson cut in 1970 with Daryl Dragon, which was only released in the U.K. Spring’s version of the string-laden song has a very understated vocal; it’s inferior to Dennis’ version, but is respectable enough. 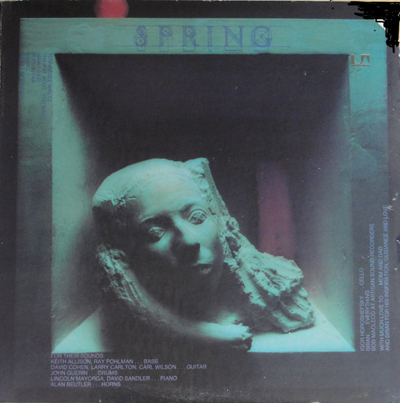 The Spring album was reissued on CD in the U.S. in 1988 (Rhino R2 75762) and in the U.K. in 1989 as Spring…plus (See For Miles SEE 269). Both versions added four bonus tracks, including both tracks from the 1973 single. The other two bonus tracks were both written by Brian Wilson and Diane Rovell: the Spector-esque “It’s Like Heaven” (which had been recorded by Shaun Cassidy in 1978) and “Had To Phone Ya” (recorded by the Beach Boys in 1976). Rarebird's footnote: The Scottish band Teenage Fanclub sampled Spring's version of "Everybody" for their 1996 track "Kickabout", recorded for the British various artists compilation The Beautiful Game: The Official Album of Euro '96 (BMG 74321382082), and also used as a B-side track for Fanclub's 1997 single "Ain't That Enough" (Creation SCR 664612 2).